Munsell Color System; Color Matching from Munsell Color Company > Color & Science > Musing About Marsala: Do Archaeologists Have a Color of the Year? My first reaction to Pantone’s announcement about the color of the year, “Marsala” was “delicious!” The name stirred fond recollections of a few nice evenings. This emotional, nostalgic association with color was especially strong, I think, because the name also evoked a flavor and an aroma—more senses than sight were at play. Understanding the cultural history of the colors we eat is an ongoing endeavor of mine. It is worthwhile, though, to step back from such visceral reactions and frankly self-indulgent thought to see that color helps us understand the world in another way. In archaeology, color tells a story of people’s choices, actions, and their place within natural processes. The decay of wood from buildings or campfires, food, and other organic remains, the selection of a particular kind of stone to make a tool, or the mining of just the right kind of clay and making the fire hot enough, for long enough, to make a ceramic vessel a particular hue—all leave their record in color (Figure 1). 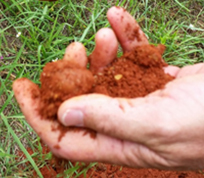 Soils rich in iron are typically reddish (Figure 2), while deposits with abundant organic remains are usually very dark. Figure 1. 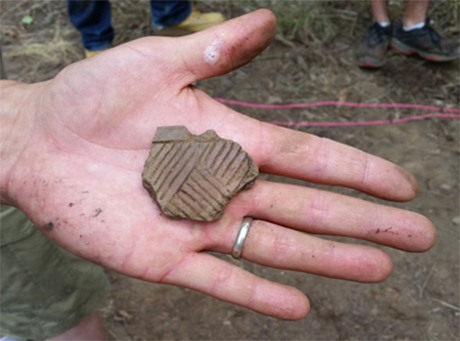 An incised sherd from the historic Cherokee town of Nvnvnyi, in Cherokee, North Carolina. The diversity of human life creates a marvelous range of color, though much of the archaeological traces of past lives could be called some form of reddish brown—precisely the realm of “Marsala.” In the early twentieth century, American archaeologists relied on color nomenclature developed as part of the growth of science during previous centuries. Initial efforts to systematically classify color began as early as the seventeenth century, and by the late nineteenth century, several color nomenclatures existed. The terms in these guides refer to artists, places, plants, and food, such as “Bittersweet Orange” “Cacao Brown” “Carob Brown” and “Chocolate.” The color names in Robert Ridgway’s 1912 Color Standards and Color Nomenclature, for one, were nearly alcohol-free, with only “Wine Purple” and no “Marsala.” As such, the names conjure tastes, places, and perspectives that are culturally entrenched. What variation in color is “bittersweet”? Even more problematically, what color is “flesh”? Figure 2. 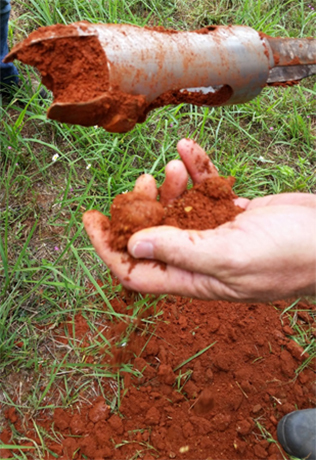 Auger sampling of clay soil from the historic Cherokee town site of Cowee, near Franklin, North Carolina. Common color terms mask a lot of variation. I’ve heard many arguments about what is “green” versus “blue” or “orange” versus “red.” Ridgway (1912:10-11) recognized this problem: “even the standard pigments are not constant in color, practically every one of them being subject to more or less variation in hue or tone, different samples from the same manufacturer sometimes varying to the extent of several tones or hues…indeed, in every case where two or more samples of the same color have been compared it has been found that no two are exactly alike, the difference often being very great” and bemoaned the “utter worthlessness” of color names unless fixed or standardized. Color guides tried to solve this problem by providing names and color samples. Later guides defined concepts of hue and chroma, and gave numerical values to them. Figure 3. 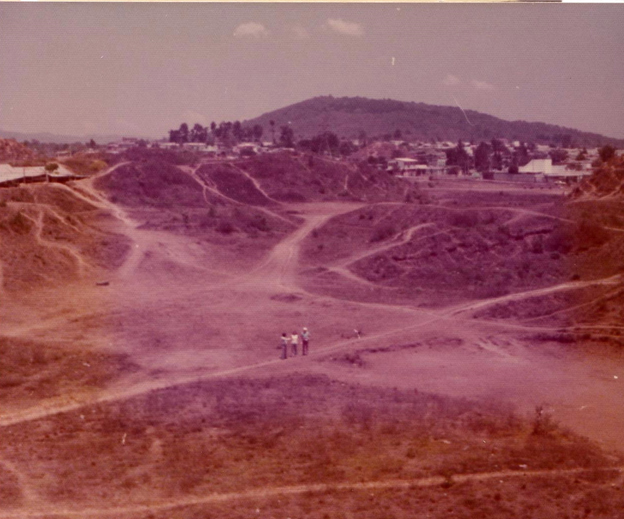 Section of the ruins of Kaminaljuyu, Guatemala, in 1975. Source: Photo by Information of New Orleans. But the very endeavor showed its limitations. Although classifying color was part of the history of science, it was equally a systematic sorting of vivid, even tantalizing cultural assumptions. All the food and plant terms in older archaeological reports make them seem almost like a recipe book of sorts. More problematic, however, is that using terms such as “Marsala” or “Morocco Red” to describe artifacts from a 1,500 year old Maya city seems another kind of colonization. Archaeologists deal with the problem of how to recognize and record a color that we may not have an appropriate name for by using the Munsell Soil Color Guide. Matching archaeological samples with values of hue, chroma, and saturation helps us distinguish fine color differences that our everyday color names do not (Figure 4). Compared to other nomenclature systems, Munsell stresses numerical values rather than names. In the next generation of work at Kaminaljuyú, Ronald K. Wetherington offered an alternate classification of ceramics and used Munsell designations to describe ceramic colors. Figure 4. 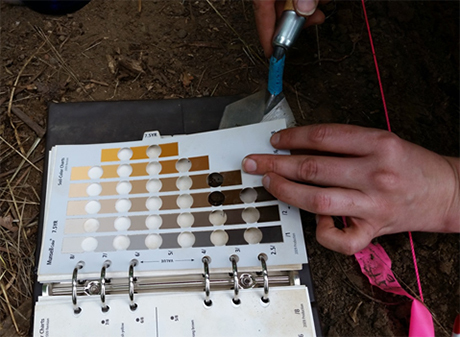 Identifying the Munsell color value for soil excavated from the historic Cherokee town of Nvnvnyi, in Cherokee, North Carolina. Why then, have a name at all? Ridgway (1912: 9) found entirely symbolic or numerical nomenclature systems “impracticable or unsatisfactory.” Names seem to give researchers a conceptual purchase on the idea of the color that numbers do not, which is precisely why names matter. Of course, the relatively simple nomenclature of Munsell is a product of the culture of science, which has its own set of values and priorities. The Munsell value of “Marsala” is 5R 4/6—not nearly so romantic, but intriguing enough, as archaeologists tend to inhabit the YR hues. The closest color to “Marsala” in Kaminaljuyú ceramics is 10R 4/6. The less vivid names unfetter, even unsettle, ways of thinking about the color, with the effect of re-thinking relationships. So, what seems neutral or distant in fact leads us back to people, to the colors of the place, time, and event. The archaeologist’s job seems almost impossible—to rediscover the flavor of past lives in their own terms, whether it concerns Maya temples or fine Italian wine. The work therefore is less about what we might call it today than figuring out what those textures, colors, and flavors meant then. Color leads us there, and while color names can be a fascinating line of inquiry in its own right, in some cases names distract us from the diversity and richness of people’s lives found in subtle variations in fragmentary remains.Though we might splash a year in Marsala today as a bellwether for the year to come, the forecast draws meaning from its deep and wide context within the fascinating history of the colors of human experience. The archaeological fieldwork in North Carolina pictured here was supported by a grant from the Cherokee Preservation Foundation. I wish to thank Laura Kosokowsky, University of Arizona, for her help, guidance, and insights about Kaminaljuyú. Kidder, Alfred V., Jesse D. Jennings, Edwin Shook (1946) Excavations at Kaminaljuyu Guatemala. Carnegie Institution of Washington, Publication 561. Wetherington, Ronald K. (1978) The Ceramics of Kaminaljuyu, Guatemala. Pennsylvania State University Press, University Park, Pennsylvania. Dr. Kathryn Sampeck is an Associate Professor of Anthropology at Illinois State University. She earned her B.A. and M.A. from the University of Chicago and her Ph.D. from Tulane University. Her research focuses on the archaeology and ethnohistory of Spanish colonialism, Mesoamerican literacy and writing, and the social history of American commodities such as cacao. Sampeck has been awarded fellowships by the John Carter Brown Library and the John D. Rockefeller Library, Colonial Williamsburg as well as grants by the National Science Foundation, Wenner-Gren Foundation for Anthropological Research, Social Science Research Council, Fulbright program, and Cherokee Preservation Foundation. 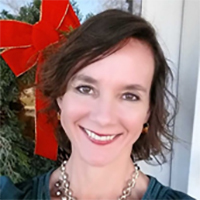 Her publications include articles in the International Journal of Historical Archaeology, Mesoamérica, Ancient Mesoamerica, and La Universidad, as well as forthcoming works in American Antiquity, Historical Archaeology, and Ethnohistory. She tweets and posts about colonial life, Latin America, archaeology, and chocolate regularly—follow her on Twitter, Instagram and her blogs on http://kathrynsampeck.wordpress.com/ and http://colonialcherokeearchaeology.blogspot.com/.